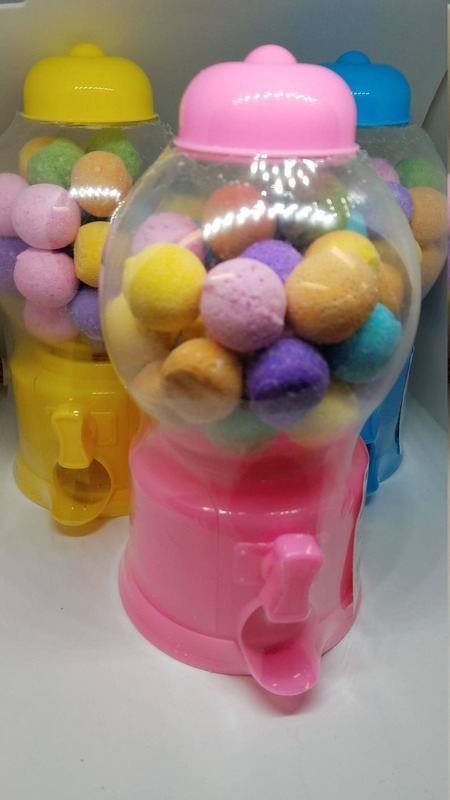 These cute little 5/8" bath bombs in a gum ball machine will make bath time a fun experience for children of all ages. Just add a few to the warm bath water and watch them fizz, fragrance and color the water. There are at least 35 bath bombs in each little gum ball machine. Yes, they dispense out of the machine with a turn or two of the knob. Each color of bath bomb is the the same fragrance. So you can use one fragrance or mix and match them for a unique one of a kind fragrance and color. The color of the machine is varied and is not a choice option. These machines are small. Pictures can be deceiving . These machines are about 6 1/2 inches tall. The colors of the little bath bombs are pink. blue, yellow, orange, green and purple. Kids loved it. Thank you.